A man has died and another was seriously injured in two incidents on successive days on Striding Edge on Helvellyn. Patterdale Mountain Rescue Team was called out on Sunday after a man fell more than 650ft from the ridge leading to England’s third highest mountain. 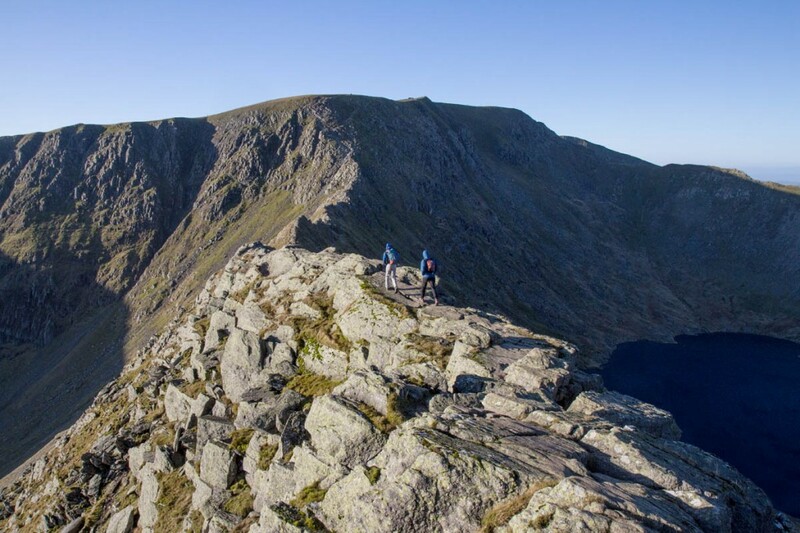 The 54-year-old man was ascending Helvellyn via Striding Edge with his family when he fell. Several experienced mountaineers who were already in the area abseiled from the ridge to the man’s location and began giving him first aid. The Great North Air Ambulance was also scrambled, but due to the bad weather it had to abort the attempt to fly to the casualty’s location. All four of Patterdale Mountain Rescue Team’s Land Rovers responded along with members of the Penrith Mountain Rescue Team and team members ascended the rough and steep terrain of Striding Edge to reach the casualty. Team Leader Mike Blakey said: “Our thoughts and deepest condolences are with the family and friends of the man who tragically lost his life after falling over 200m from Striding Edge on Sunday. The following day, a man and his dog fell a similar distance from Striding Edge, with both suffering very serious injuries. Patterdale MRT was also called out shortly before 3pm on Monday to the second incident. 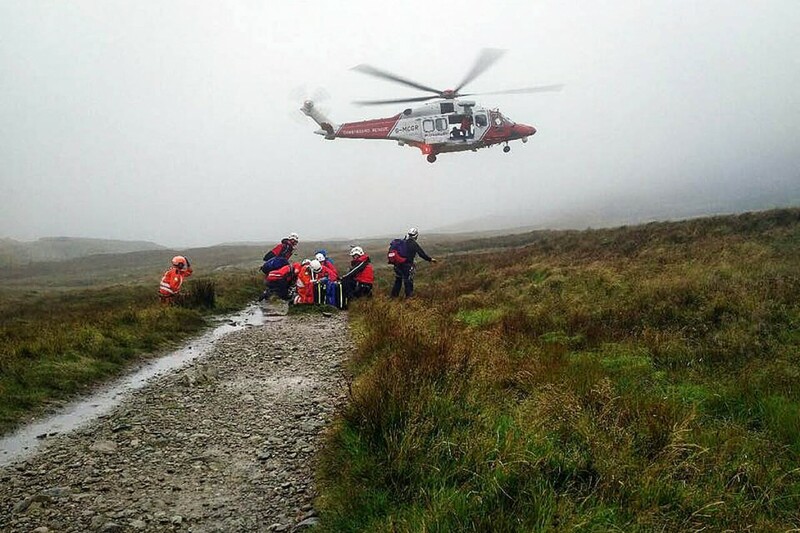 The spokesperson said: “The man sustained very serious injuries and was treated by team members and the Great North Air Ambulance doctor and paramedic who climbed up to the casualty’s location alongside Patterdale team members. “Given the poor weather, the team swiftly lowered and carried the man below the cloud to a point at which the Coastguard Rescue 199 helicopter [from Prestwick] could evacuate. “The Coastguard helicopter crew did an astounding job at getting as close as possible to the team in atrocious flying conditions. An amazing and truly heroic effort by this aircrew and the doctor and paramedic who flew with him. “The man’s dog is currently at a local veterinary practice having been treated by the team’s vet on the scene. He has suffered a serious leg fracture and will be operated on tomorrow by the team’s vet. He’s comfortable at present. 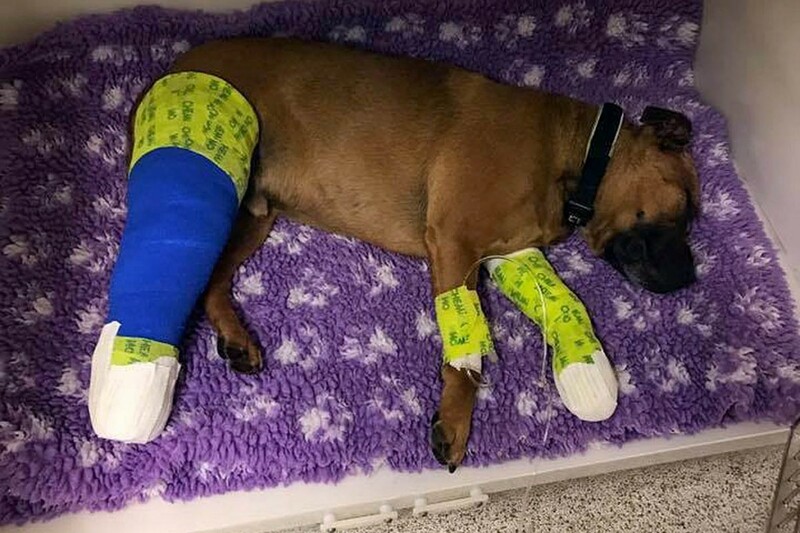 Mr Blakey said: “We are all hoping for a positive outcome for both the man and dog as every emergency service member involved gave their all to give the best friends the best possible chance of survival. Mr Blakey also thanked Penrith Mountain Rescue Team who provided backup for their Patterdale colleagues on both rescues. While the Patterdale team was dealing with the incident on Sunday two mountain bikers were also treated for injuries, one for a deep laceration to his leg and the second for a hip injury. They both cycled over a rocky outcrop on their descent from Helvellyn. Later that evening the team was called out to search for a father and daughter reported as missing on Helvellyn. They turned up safe and well as the team was responding. Well done to the rescue teams involved. Can't believe the people who take these risks, some even with small children and dogs, when will they realise it's not a game and can have very serious outcome. So selfish to put rescuers in danger also. Photos posted on FB over the weekend show the weather was bad. I don't like to judge the victims. I have done Striding edge in scorching sun, rain and snow and think it is manageable with care in all conditions except for very high winds, though rain makes it seem more than a grade 1 scramble. I see no evidence that the deceased or injured were careless or ill equipment or guilty of anything except unfortunate clumsiness at the wrong point. As I have said elsewhere a warning notice provided by the Parks Authority might help but when all is said and done it is a magnificent grade 1 route and well worth doing, unlike some other accident blackspots. Well done MRT for a fantastic job as always and a huge thank you for the support you offer when the worst happens. Audrey I don't think victim blaming helps anyone here and just creates hateful speech that is not necessary ever and especially not after a tragedy like this. As with everything in life there are always risks but i don't see anything here that suggests the family were ill equipped for the walk it sounds like an unfortunate accident. As for people being selfish for taking children and dogs i think this completely depends on the nature and lifestyle of dog or child as to whether its safe to have them on the ridge in the same way its not 'safe' to have an ill prepared adult on the ridge. I've been up many times in most conditions and apart from Ice and wind it's manageable with care and children included in that as long as your sensible. Please don't judge it's so not necessary! Please don't judge anyone who does this. I did this on Saturday with my husband and dog - I'm not experienced and less than an amateur - I found it very very tough - we took our time - it took us 9 hours and got back just as it was getting dark. It is risky but accidents happen, there is so much scope that things can go wrong. Our dog did very well too - she's small and timid but my husband managed to help both me and the dog round the entire route. I'll probably never do anything like this again, but please don't say it's selfish to do it. The rescue teams are amazing, well done to all of them. I hope the gentleman and his dog make a speedy full recovery. Would like to know how the dog came to be injured. Generally, with their four points of contact, they never fall off. (Okay, there was Rottweiller came off Sharp Edge last year, thankfully on the tarn side, but he was fine and uninjured) Was this one on a lead? Did the owner fall on him? I raise the issue as dogs-on-lead on steep or difficult ground or other demanding places are potentially very dangerous. Wonderful response from the Mountain Rescue and all concerned in the rescue. Wishing the man and his dog good wishes for a full recovery. These volunteers are just remarkable. MRT, all your efforts for those who enjoy the hills are very much appreciated. Especially in cases such as as these. Unfortunately this isn't the first and won't be the last fatality on Striding edge. I've been across this before and will in the future. Experienced or not, accidents do happen everywhere. I'm personally not a fan of of takings animals across this one, and is certainly for more experienced individuals. But accidents can happen to anyone. My thoughts are with those effected by this. What made you decide to climb this route? As you wrote, "I'm not experienced and less than an amateur" did you or your husband consider gaining more experience before tackling this route? Were you aware before starting out that Mountain Rescue existed and if you did, were you aware that team members are volunteers? I know the individual who was rescued by Patterdale MRT. He is a very fit and experienced hiker and served 30 years in the 'Emergency Services' where we worked together. I can tell you that he has been transferred from Intensive Care to High Dependency and they hope to transfer him by air to his local hospital soon. As ex emergecy services and ex MRT myself, on his and his familys behalf I would like to express deep gratitude to our colleagues in Patterdale MRT, the team doctor and the vet for an outstanding job well done in difficult circumstances. I can also tell you that his emergency service friends and colleagues are planning a charity cycle ride (he is a very keen cyclist at a very high level) and a hike to raise funds for Patterdale MRT by way of thanks. Awesome job guys, well done. I consider myself to be an experienced fell walker and I have crossed the edges of Helvellyn many times and in all weather conditions. Without realising it many people do take chances on this mountain and live to tell the tale , whilst a minority get injured or unfortunately loose their lives. I feel so sad for these persons and their families because for every unavoidable accident many could have been prevented. I have seen children "in the correct clothing" almost running along the edges way ahead of parents. people in sports training shoes. people not watching their next step because they are keeping an eye on their dog or their walking partner. Persons doing small jumps across loose wet rocks or patches of scree whilst descending the edges. I wondered when I recently seen a young lad fall on the wet rocks of Swirral edge doing his short "fell run" twenty meters ahead of parents who thought it was quite funny seeing him rubbing the mud off his legs how that same mum and dad would have felt looking at him lying 300 feet below near Red tarn ! The Lakeland mountains including Helvellyn and its ridges are there to be enjoyed by all, experienced walkers and family persons we may be, however we are NOT mountain guides and I am sure that the MRT and the fell top assessors would not condone the actions that I have highlighted and like them I have never heard of anyone falling off the edges twice !! Please keep safe especially with the winter months approaching, take nothing for granted and keep those loved ones safe at all times, remember you took them up Helvellyn you have a duty to bring them home. On Sunday 29 October 2017 I was with friends descending Swirral Edge - in perfect weather - when we came across an accident. A walker had fallen on the northern side of the edge. Fortunately he had survived and was awaiting MTR with a companion. People on the Edge reported that "the path had given way under his feet". Path erosion is a major problem in the Lakes and thanks to the heroic efforts of charities such as Fix the Fells many pitched paths have been and are being laid. But it must be nigh impossible to work on the narrow Swirral Edge path. I guess the advice has to be to keep away from the edge of the path - as we did on the way down. I am not an experienced climber/ fell walker. But I climbed Helvellyn last Saturday with 3 friends which for me was a huge challenge. Starting at 10 am and finished before 6 pm. It was a very hard climb and i am pleased i managed it but i will never do it again! Weather was very good. people were very friendly and helpful especially the young couple from the Manchester area who helped me with my shoelaces and back pack. I did this route in my thirties, alone and as I reached the summit end, cloud descended and visibility fell to two or three metres. I froze and lay prone on the sparse greenery before the summit and crawled slowly upwards towards voices. The cloud cleared and I was just metres from the summit and SAFE. I believe this route is safe but should be treated with great respect, place feet carefully, don't trust shale. If need be, cling to the rocks. If cloud descends, freeze up. Dense cloud complete disorientates. I think taking a dog is possibly a no no. Approach from the Thirlmere side instead. I'm not sure I would take young children across, there heads are so full on nonsense and don't see danger. I have recently undertaken four climbs of Helvellyn wild camping at red tarn in the evenings I am dismayed at the amount of litter that is discarded in crevices along the edges, around the shore of the tarn and along the pathway from the tarn down to the youth hostel. No long ago quite a lot of rubbish including an old tent was left on the grassed area near the two small wooden bridges on this pathway. The national trust people were disgusted they showed me the pictures. Perhaps signs could be erected on Green side road at the junction where the bench is sited; right for the youth hostel left towards Mires beck. At the junction for Lantys tarn before the camp site and at the car park at Thirlmere reminding selfish people that this is a national park cared for by many and disrespected by the few. The signs could be in keeping with the area with a simple message; if you can't bring your waste down don't take it up. I watched a video of the Striding Edge on youtube. The stability of the ground at the ridge was my concern. Then i googled "deaths on Striding Edge" and came here. Here i found the confirmation that my concern is not groundless: "People on the Edge reported that "the path had given way under his feet". Path erosion is a major problem in the Lakes ". Yes. Mountains give way and move UNPREDICTABLY. The No1 condition of safe scrambling is constant assessment of safety and stability of the terrain. Not sure safe or stable - find a workaround. Otherwise it is a lottery.